What do parents need to know about video games? Every game has a rating set by the Entertainment Software Rating Board (ESRB), but it is always best to read reviews of a game, and watch your child or teen play, in order to get a better understanding of the content. Many gamers also video broadcast their gameplay to a public audience (known as livestreaming) using online services like YouTube or Twitch, and your teen may be interested in doing the same. Before allowing your teen to livestream their own gameplay, learn about the risks and benefits involved. Esports, in which professional gamers compete in tournaments, is another way in which teens play and view games. Video game “addiction” has also become popular recently, with both the World Health Organization and the American Psychological Association identifying gaming disorder as a behavioral health concern. If you are concerned that your child or teen may be struggling with their sleep, grades, or other health-related issues as a result of their gaming, see our Problematic Interactive Media Use resource for more information. 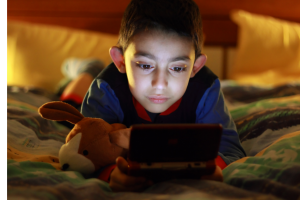 Research shows that video games are popular, but why do kids enjoy these games so much? 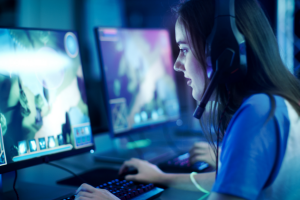 Motivations behind video game playing vary depending on the child or teen, but research shows that video games allow youth to escape their problems; to try on different personalities; to socialize; and to engage in challenging and reward-based experiences. Where can I learn more about video gaming? 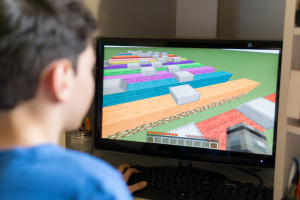 Is it ok for my 8-year-old child, who has ADHD, to play Minecraft? The Mediatrician Speaks – Pokémon Go! Still have questions? Ask the Mediatrician! Cyberbullying and sexual harassment: Many online games allow the player to interact with others via text or voice chat, and your child may be exposed to threats, offensive language, or other objectionable content–they may even engage in bullying others. Female gamers are often targets of sexual harassment. Aggression: Children can learn that violence is an appropriate way to solve conflicts, and evidence shows that playing violent video games has the potential to increase aggression in some youth. Desensitization: As children are continually exposed to violence in video games, they can become desensitized to it over time. Anxiety: Some children may develop anxiety as a result of playing video games. Sleep: Video gaming before bed can contribute to a variety of sleep problems, including poor quality sleep and not enough sleep. Obesity: Video game playing can contribute to increased calorie consumption. Physical activity: Exergames that are also a form of exercise (such as Dance Dance Revolution or Wii Fit) can encourage kids to move around while playing a video game, combating the typical sedentary aspects of video game play. Prosocial skills: Video games that encourage the player to be helpful, cooperative, and altruistic, may positively affect a child’s real-life helping behavior. Cognitive skills: Video gaming has the potential to improve brain functions like visual processing and information filtering, and many teens believe that playing certain games help their problem-solving skills. Critical thinking skills: Video games designed with a specific purpose have the potential to educate children (such as games designed to teach healthy eating habits). Research is still emerging in this field, and more studies need to be completed before we know the long-term effects of video games on the health of youth. It is easy to become involved in a game and play for hours at a time, but children benefit from a variety of activities. Agree on a certain amount of time to play games and suggest other activities they might enjoy. Remember, the content of what your kids play is just as important as the amount of time they spend playing. When your children ask you for a new game, do you homework before you agree to purchase it. Learn the game’s ESRB rating, read reviews, and even play the game first before you allow your kids to play. If the game isn’t appropriate for their age or doesn’t match your value system, find an alternative game. By keeping the video games in a family area, you can see how, and how often, they are being used. You can also more easily keep track of time limits. Studies have shown that children with electronic media in their bedrooms are more likely to be overweight and have sleep problems. Many games are multiplayer in nature, and will allow your child to chat or share content with other players who are often strangers. Be sure to set-up these accounts with your kids and let them know that you have their passwords should they ever need help. Discuss the importance of maintaining anonymity and privacy in these online environments with your teens, and consider disabling the features entirely for younger children. Video games are fun and challenging for adults too. Parents can spend time with their youth by having a family gaming night (just make sure that the games are appropriate for everyone involved). Help your child or teen understand that in-game purchases are costly, and set limits on whether they can or cannot make these types of purchases. Parents can also consider restricting or disabling these features.